The Homeopathy Research Institute (HRI) was delighted to host our third international conference on “Cutting Edge Research in Homeopathy” on the island of Malta. “HRI Malta 2017” provided a forum for researchers from around the world to come together, not only to present their latest findings, but also to discuss the challenges faced by the homeopathy research community and plan strategically for the future. A clear theme emerged over the course of the event, namely, an appreciation of how far the academic field of homeopathy has come in recent decades and how much has been learnt from past experience. Collectively, we have gained insights into how to conduct studies to maximise their quality, validity and impact. Presentations demonstrated how the problems and weaknesses in earlier research are being identified and understood, allowing present and future projects to avoid these pitfalls (see conference report: “Investing in the Future of Homeopathy Research”). This maturation is apparent in all sub-fields of homeopathy research, but nowhere is it more obvious than in fundamental and basic research where a greater overall understanding of the phenomenon we are investigating is leading to improved replication of results (“Learning from ‘Failed’ Studies”). To paraphrase the saying “looking back, moving forward,” it is clear that as a community of researchers, we have looked back, and we are indeed moving forward. A general consensus emerged that a broad portfolio of clinical, basic, and fundamental research is still needed, rather than any single approach. Perhaps even more importantly, delegates and panelists also agreed that as a community we need to pursue even greater levels of international collaboration—particularly between India and other countries—as the challenges faced by homeopathy take on an increasingly global aspect. Homeopathy continues to be unjustifiably attacked on the assumption that there is no evidence that it is effective and that homeopathic medicines are “just water” or sugar pills. Consequently, we see examples from multiple countries of decisions being made to reduce patient access to homeopathic treatment and reduce the provision of university-based homeopathic training, solely due to the false perception of the status of the evidence base. Such attacks show the continued lack of objectivity in the way in which our evidence base is viewed, used, and presented to key decision makers. If one uses simple logic, the presentations in Malta alone should be sufficient to demonstrate to any unprejudiced observer that the overall trend in research findings is incompatible with claims that homeopathy is “only” a placebo. For example, a wide range of physicochemical experiments can identify differences between homeopathic preparations and water (“Addressing the Implausibility Argument”); a variety of animal/plant experimental models show that homeopathic medicines can have biological effects (“Addressing the Implausibility Argument”); and clinical effects are seen in human trials with various methodologies, looking at patients with a range of clinical conditions (“Latest Clinical Research Findings”). So, this begs the question of why the argument that “there's nothing in it” continues to prevail in certain quarters. By HRI Rome 2015, there was a clear feeling from the researchers present that the time had come to conclusively move beyond this argument, yet, the sad reality is that in 2017, the global homeopathy debate has continued to revolve around the same point. 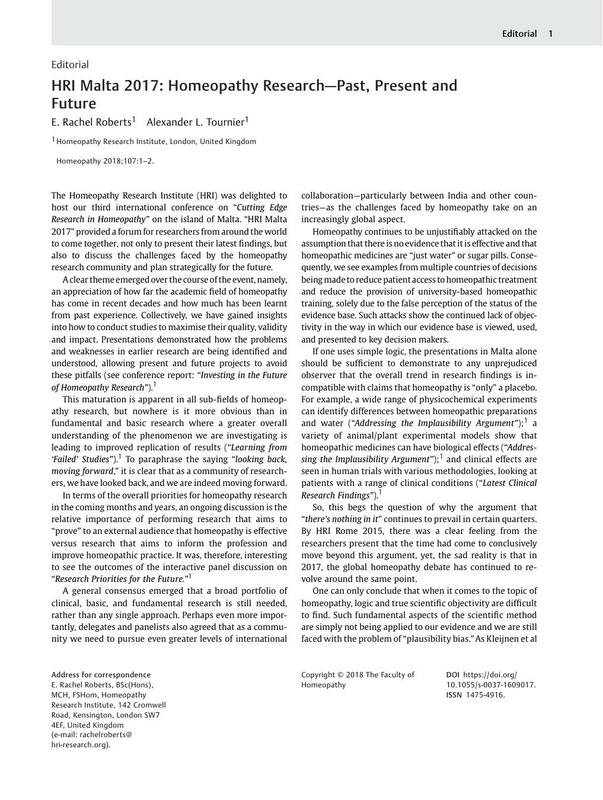 The homeopathic research community, therefore, needs to continue its efforts in building the evidence base for homeopathy, focusing on robust studies with the greatest potential impact, including, of course, studies which take us toward a firm and demonstrable hypothesis for the mode of action of homeopathic medicines. As an international charity dedicated to promoting high-quality research in homeopathy, HRI is proud to host our biennial conferences, as we understand the importance of providing a forum for colleagues to openly exchange ideas, to find a supportive community, and to form the exciting new international collaborations that are needed for us to reach our common goals. 1 Mosley AJ, Roberts ER, Partington H. , et al. Conference report: HRI Malta 2017–Cutting Edge Research in Homeopathy: HRI's third international research conference in Malta. Homeopathy 2018; 107 DOI: https://doi.org/10.1055/s-0037-1609018.